I’m jazzed, psyched, thrilled, and otherwise quite ecstatic!! Have I perhaps understated my emotion? 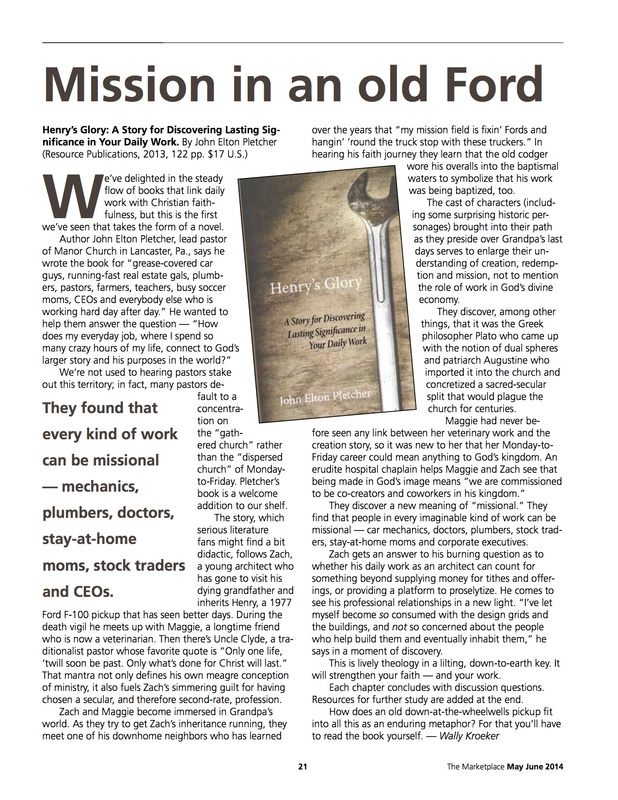 Henry’s Glory is reviewed in the current issue of The Marketplace magazine. In case you wondered, it’s a pretty big deal for a rookie author like me to have his book reviewed by an actual magazine—so I’m deeply honored and I’m shouting great big praise to God! Here are two excerpts from Wally Kroeker’s review, and his full comments can be viewed at http://www.meda.org/the-marketplace-magazine. Click on the mag cover and access page 21. And of course, feel free to share this with friends. Thanks for checking out the review, for helping spread the word about Henry—and for joining me in thanks to God for such a positive review! Blessings, joy, and fruitfulness in all your work this week! Fall of second grade, I proudly submitted a carefully crafted biography of my mom, composed on classic, dotted-line paper. This was a special writing project, to be displayed in our hallway for parent-teacher night. I waxed eloquent, reporting with the utmost, seven-year-old precision: “My mother does not work. She is a housewife.” Little did I know how clueless my statement was or how ridiculously male chauvinistic. Mom had to have felt like it was hopeless—all that time, her amazing nurture, and energetic hard work—what a waste. I must have seemed like a hopeless case. Mom-hood reveals ever-deepening layers of hopelessness. After all, moms’ work is never done. School projects. Taxiing kids. Financial pressure. It all builds up and pushes down on a mother’s soul. Mom is expected to be the Chief Operating Officer of the family corporation. Along with endless tasks, moms are deeply concerned about their kids’ feelings and also each unique developmental stage. God wired moms with emotional and developmental radar, in great contrast to dads. Most guys are only slightly aware that there might be some small humans, under four feet tall, living in the house. Mix in all of a mom’s concern over her kids’ choices, friends, and future plans. Any cocktail of these ingredients yields high anxiety. Mom’s work can feel hopeless. So what’s a mom to do? 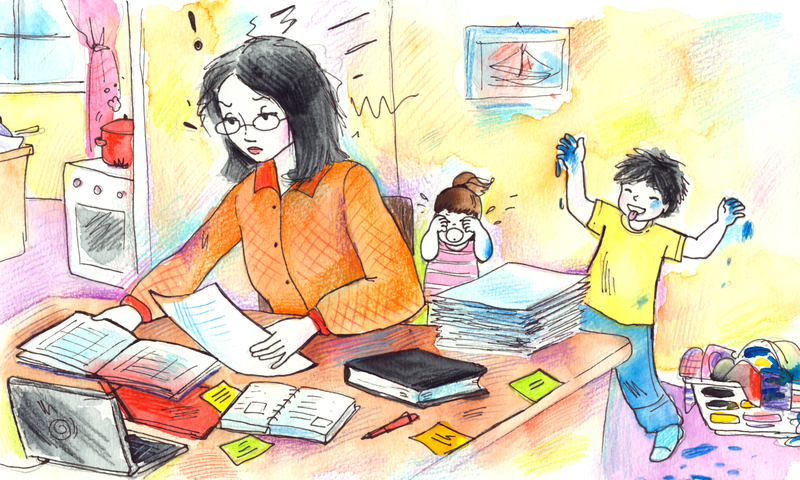 Where can moms find fresh doses of new hope in the midst of all they juggle at work? I’ll propose that several hope-filled insights emerge from a couple of women, undeniably two of the greatest moms in all of history. It seems that a YES to God is the essence of deep trust—genuine dependence—and the very core of faith for all of us. Will moms step boldly into what God wants? Will you listen and be receptive to God’s words, his instructions? Will you process life’s difficult assignments, hard tests, and rascally scenarios through God’s truth and his powerful presence? Years ago, there was a mom named Susanna. She had a gaggle of ten kids with her husband, Sam. Sadly, their house caught fire and all but burned to the ground—not once, but twice. Her husband was devoted, both to God and to Susanna. However, Sam also had a very judgmental side, often expressing strong critique toward her and the children. He was also precarious with money, which made life extremely difficult for the family. Susanna constantly sought to cultivate Jesus’ values and heart, in all daily actions with her children. One of their girls, Hetty, a very bright but equally strong-willed young woman, kicked up her heals. She recklessly leaped into a brief fling with a young lawyer and got pregnant outside marriage. This caused great disgrace to the very proper and religious family. Dad disowned her, but Susanna persevered with motherly love for her wayward daughter, Hetty. This is actually a very old account, so you might benefit by hearing one of Susanna’s prayers. Each phrase reveals just how integrated she was about her daily work and how much she desired to incorporate Jesus’ heart into her own heart as well as her children. Susanna’s son, Jacky, became one of the foremost leaders, thinkers, and provocative communicators of his era. John, as he was widely known outside the family, left a massive footprint on the culture of his day. And Susanna’s son, Charles, is responsible for crafting amazing songs, many of which are still sung in churches today. The family name is Wesley. Their profound legacy in Christian thought and practice resulted from Susanna’s passionate aim to form Christ’s heart in all of her children. Both Mary and Susanna’s examples point out this vital truth: Mom’s best hope is found in connecting her own heart—and her kids’ hearts—with Christ’s heart! There was a fantastic outcome for Mary’s work, even after comically losing Jesus in Jerusalem for three days. (How do you lose the Son of God?) Luke 2:51-52 notes the holistic development. Jesus grew in wisdom, in physical height, and in favor with both God and other humans. When moms access Jesus’ heart and choose to say YES, then kids grow strong and experience whole-person development—mentally, physically, spiritually, and socially. Don’t miss it, moms. Your kids can grow up to make HUGE impact, to touch lives and become big workers in God’s kingdom business. You might say, “My kid will never be a Wesley. And he or she certainly won’t be Jesus.” OK, but you can raise kids who grow up to work hard daily, build the next bright future, fight disease, solve hunger crises, create noble cultural endeavors, plant churches, and in a myriad of other ways, share Christ with a world in desperate need of Jesus’ grace. Moms, we thank you. Realize it or not, your work is full of hope!